The State “Kizhi” Museum is located on the Island of Kizhi in Lake Onega, in 68 km. distance from Petrozavodsk, the capital of the Republic of Karelia. The Museum has been researching, preserving and popularizing culture of the native peoples of Karelia for more than 40 years. 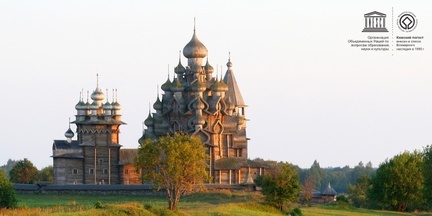 The collection of the Open-Air “Kizhi” Museum includes 83 monuments of wooden architecture: old chapels and houses, windmills and granaries, threshing barns and racks for drying crops…The gem of this collection is the 22 domed Church of the Transfiguration of Our Savior, 37 meters height. The Church of the Intercession of Holy Mary and the Bell-Tower located nearby emphasize the harmony and magnificence of the main Church. The guests of the museum can visit the Church of the Intercession of Holy Mary and peasant homesteads. Traditional crafts are demonstrated in peasant houses; wind flows bell-ringing over the island. Wonderful performance of the Museum folk ensemble supplements the impressions of the traditional peasant culture. The visitors whose stay on the island concurs with one of the Museum festivals will have the most lasting impressions. The Kizhi Pogost Ensemble was enlisted into the World Heritage List of UNESCO in 1990. In 1993 by Decree of the President of the Russian Federation the Kizhi Museum collection was included into the State Code of Cultural Heritage Sites of Special Value of the Russian Federation. Book tickets to the island of Kizhi. The international organization devotes much attention to the Kizhi Architectural Ensemble enlisted into the World Heritage List of UNESCO and to preparation for the restoration of the Church of the Transfiguration of Our Savior. The World Heritage List of UNESCO aims at protecting and popularizing unique objects of historical and cultural heritage. Assistance in organizing the monitoring of preservation of natural sites.